A locally-based female chef is preparing to open her very own commercial kitchen and event space. Read on for the delicious details. 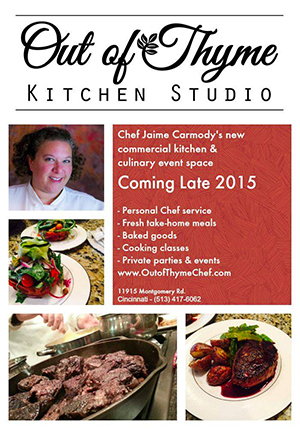 Chef Jaime Carmondy’s newest project is Out of Thyme Kitchen Studio. Maintaining a healthy diet is difficult, especially during the holiday season. That’s why Chef Jaime Carmody, one of only 12 Personal Certified Executive Chefs in the country (as designated by the American Culinary Federation), can help you stick to a routine through her customized meal plans that are tailored to each client’s tastes and dietary needs. Carmody’s passion for food dates back to when she was merely 14 years old – finding herself an employee of the food and beverage industry before she could even drive. After studying at the Scottsdale, Az.-based Scottsdale Culinary Institute, she then went on to spend time with Arizona chefs and later entered into the hotel industry. As the executive chef at the Hilton Garden Inn in Carlsbad Beach, California, Carmody received her greatest breadth and depth of experience with management, banquets, catering, restaurants, room service and employees. Despite her accomplishments, her heart longed for her other aspiration – to be a mom. Since launching Out Of Thyme in January 2005, Carmody has established her own successful roster of clients, with most of them being weekly, long-term customers. She is also frequently invited to teach at all of the area cooking schools, including Midwest Culinary Institute and The Learning Kitchen. Right now, Carmody’s sights are set on working really hard on her next project – opening The Out Of Thyme Kitchen Studio. Opening in late 2015, The Out Of Thyme Kitchen Studio will be a full-service, commercial kitchen and event space located on Montgomery Rd. in Symmes Twp. The Studio will offer Carmody’s Personal Chef Services, fresh take home meals, pop-up dinners, baked goods and cooking classes for both children and adults. The space will also be available for private parties, tastings and other culinary events. To learn more about Chef Carmody’s recipes or to view her class calendar, visit www.outofthymechef.com. For juicy updates, follow Out Of Thyme on Facebook and Instagram. Editorial Intern - Brittany Lee is an editorial intern for Cincy Chic. Contact her at blee@cincychic.com.